Although Microsoft has never released Visio for Mac 2019, the good news is there are some superb alternatives that can do everything Visio can on a Mac – and more. In fact in some cases, we think the software featured here are even better than Microsoft’s product when it comes to visual communication and collaboration. Most are certainly easier to use and in almost every case, are more cost-effective than Visio Pro which currently costs $589.99. There’s no need to say goodbye to your precious Visio diagrams and stencils either. All of the tools here can import and export MS Visio files although only SmartDraw can export to the latest Visio 2016 VSDX format. So whether you’re a Project Manager or Business Analysis that needs to visualize processes better, a Site Engineer that wants to easily draw floor plans or an HR Manager trying to make an org chart on a Mac you’ll find something here to solve your diagramming needs. Note that if you’re a Project Manager looking for a replacement for MS Project which also doesn’t exist on Mac, you may also find our guide to the best Microsoft Project alternatives for Mac useful too. Here then are the best Visio alternatives for Mac users in order of ranking. 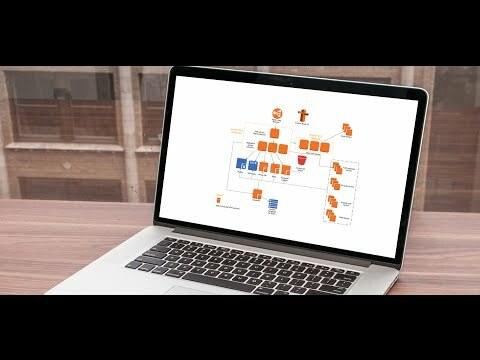 SmartDraw is easily the most powerful yet easy to use alternative to Microsoft Visio on a Mac. The best thing about SmartDraw is that it does everything that Visio can but makes it far simpler and faster. It’s been designed specifically to rival Visio (rather than just an all-purpose diagram tool like many others) and this is clear in the little touches that make it stand-out from the crowd. For example, it’s the only alternative to Visio that can both import and export to the latest Visio 2016 VSDX format. This is absolutely crucial if you need to work on diagrams with Visio based colleagues or Windows users. The same goes for Visio stencils. If you have hundreds of Visio stencils that you don’t want to say goodbye to, you can just import VSD and VSDX Visio stencils into SmartDraw and keep using them. The interface of SmartDraw will feel familiar to anyone that’s ever used Visio but its far more user-friendly with a slick design that looks great on macOS. One area where SmartDraw even blows Visio out of the water is in templates and objects. There are more than 4,500 diagram templates in SmartDraw compared to little more than 100 in Visio. These cover almost every conceivable need from flowcharts, org-charts and floorplans to topics as diverse electrical layouts and crime scene reconstructions. The time you save by being able to instantly dive in and edit these ready-made templates means it takes significantly less time to create diagrams in SmartDraw compared to Visio. The same goes for the toolset which has more than 34,000 symbols compared to around 1,800 in Visio 2016. They look better too because they’re in high quality crisp SVG vector format. One of the biggest advantages SmartDraw has over Visio is the Smart Formatting and auto-diagramming features. SmartDraw automatically re-balances diagrams and layouts so when you change connectors and move things around, it adjusts things for you to keep things tidy. This makes a big difference compared to Visio where you have to do a lot more painstaking and tedious manual adjustment of swimlanes, text wrapping, shapes and other diagram elements. SmartDraw also recognizes that there’s a lot of Project Managers and Business Analysts out there making the switch from Visio need both a visual communication tool and project management tool on their Mac. You can instantly turn SmartDraw Mind Maps into Gantt Charts and even send tasks to Trello where they are dynamically updated as task are completed. This is a really slick touch to SmartDraw and we like the way changes made in one view, are instantly reflected in the other. We also like the fact that SmartDraw doesn’t try to lock you into its own ecosystem and format. If you want to share diagrams, you can easily can export files to Microsoft Office, PDF, SVG or PNG format. Or if you just want to send someone a diagram online, you can send a URL of the diagram with customized permissions which allows anyone to view or edit it. The same goes for Jira and Confluence. SmartDraw has plugins for both that allow you to create diagrams within Confluence for example without even opening SmartDraw. This is another big plus over Visio which offers no official way of even viewing Visio diagrams in Confluence, never mind actually create diagrams in it. Although there are other rivals to Visio that offer Confluence integration, SmartDraw has the best by some distance. 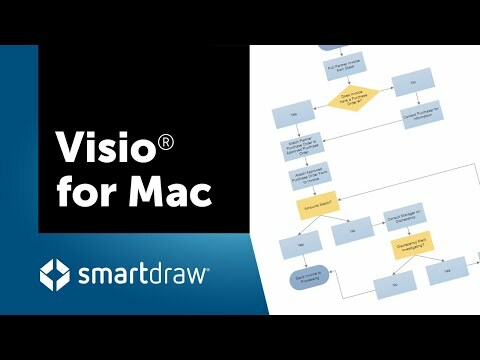 In summary, SmartDraw is a powerful alternative for anyone looking for Visio on a Mac. It produces results as good as Visio but with considerably less effort and time. For a more detailed look, you can check out our in-depth SmartDraw review. You can also see how SmartDraw vs Visio compare below. If online apps are not your thing, OmniGraffle is the closest thing to a native Mac desktop alternative to MS Visio. OmniGraffle is designed specifically for Mac although it’s a more artistic design tool than Visio and it’s not as easy to use at SmartDraw. However, once mastered OmniGraffle produces attractive, professional diagrams, user interfaces and wireframes that look better than anything possible in Visio. It’s important to note from the start that although OmniGraffle can import Visio files, it can’t export files to the latest Visio VSDX format like SmartDraw can. If you’re going to working alongside with PC based Visio colleagues, that will rule it out straight from the off. OmniGraffle Pro can import all Visio formats (VSDX, VSD, VDX) fand Visio stencil files (VST, VTX, VSX and VSS). Note that Visio import support is not available in the Standard Version of OmniGraffle ($99). Although there’s aren’t so many stencils and templates included in OmniGraffle, it has a dedicated following of users that have created repositories of free OmniGraffle Stencils. Diagrams created in OmniGraffle look better than those in Visio because it uses high quality vector graphics. There are more tools for illustrating diagrams in OmniGraffle meaning you can create some really eye-catching flowcharts. OmniGraffle is also the only diagramming software on Mac that allows you to use the Touch Bar on new MacBook Pros. This helps streamline your workflow and improve productivity without having to use the TouchPad or mouse all the time. It also has a very good native iPad app OmniGraffle for iOS ($49) that supports the Apple Pencil and syncs with Mac via iCloud. Finally, for Project Managers, OmniGraffle is fully integrated with project management tool OmniPlan from the same developer. OmniPlan is also a powerful project management tool which makes a great replacement for Microsoft Project on Mac. Overall, we really like OmniGraffle because it’s designed specifically for Mac with the needs of Mac users in mind. It’s not as fast and easy to use as SmartDraw and it’s more expensive but if you want something desktop based rather than Cloud based, OmniGraffle is one of the best alternatives to Visio out there. You can try OmniGraffle free for 7 days by downloading it from the Mac App Store. If you decide not to upgrade to the Pro version, you can still keep OmniGraffle as a free desktop Visio viewer on your Mac. You can also check out our full OmniGraffle review for more. Lucidchart is a powerful online diagramming software with strong team collaboration features and excellent integration with Microsoft Office. While it’s not as slick as similar Cloud based solutions like SmartDraw and doesn’t come close to it in terms of templates, objects or graphics quality, it’s still one of the leading diagramming tools out there. Lucidchart can import Visio files (although it can’t export to the latest Visio VSDX format). You can also import Visio stencils in VSS or VSX format (although Visio templates in VST or VTX format are not supported). One particularly nice touch is that Lucidchart tailors the interface and toolset according to your industry and needs such as engineering, flowcharting, UML diagramming etc. Lucidchart really excels at multi user collaboration and allows you to chat with others inside the app, see revision changes, leave comments etc. There are free Lucidchart plugins for JIRA, Confluence and Jive integration. Lucidchart is very well-integrated with Microsoft Office 2016 so you can draw diagrams directly in Word, PowerPoint and Excel. There’s also a handy Chrome plugin that allows you to draw diagrams offline. Overall Lucidchart is an easy to use online diagramming tool ideal for team collaboration and those that need good integration with Microsoft Office. 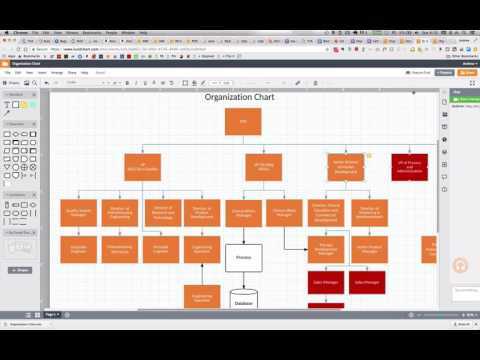 For a more in-depth look at Lucidchart, check-out our full Lucidchart review. You can also try a free trial of Lucidchart. ConceptDraw Diagram (formerly ConceptDraw Pro) is a cross-platform desktop alternative to Visio that works on both Mac and Windows PCs. Firstly, it’s important to be aware that although it’s a decent diagramming tool, the Visio format compatibility in the Mac version is not great. ConceptDraw Diagram claims to import Visio stencils in VSS format and Visio VSD/VDX (from Visio 2007-2010) but the reality is the formatting is a mess. The same goes for ConceptDraw Diagram’s claim to export to Microsoft’s newer open XML file format VSDX used in Visio 2013 and 2016. The VSDX import and export tool does not work well at all and certainly nowhere near as smoothly as with SmartDraw. However, if Visio compatibility is not important to you, ConceptDraw Diagram does a better job of exporting diagrams to Microsoft Office and Evernote among other formats. There are plenty of templates to get you going divided into different areas such as landscaping, engineering, management, science, flowcharts etc. There’s also a rich collection of high quality vector objects, audiovisual clips, additional templates and tutorials in ConceptDraw Solution Park. ConceptDraw Diagram allows you to create presentations and slideshows of your diagrams. For Project Managers, it can be used alongside ConceptDraw Project which is a powerful project management software made by the same developer. ConceptDraw Diagram is a viable option if you want something similar to Visio that works on both Mac and PC desktops. You can try a free trial by signing up for a ConceptDraw account. You can also check out our review of ConceptDraw Diagram For Mac. Pricing: $199. Minor updates are free. Gliffy is an extremely easy to use team focused Cloud diagram software that’s ideal for collaborating on UML, network diagrams and org charts. Gliffy is actually divided into two tools, Gliffy Diagram and Gliffy Project. The latter is for integrating and sharing your diagrams with Atlassian products such as Jira and Confluence. The biggest disadvantage of Gliffy is that although it can import Visio files, it can’t export to Visio which rules it out if you need to work alongside other Visio users. Gliffy does however have a Chrome extension so although it’s Cloud based, you can create diagrams offline. It also syncs with online storage solutions such as Google Drive and Dropbox directly from your desktop. Gliffy’s WYSIWYG interface is based on HTML5 which means it’s fast and responsive. It uses a drag-and-drop interface which makes it easy to add objects and connectors to your diagrams. Gliffy is an excellent choice for teams as it has full revision histories for diagrams, private sharing and all users can leave comments on diagrams. Sharing diagrams in Gliffy is also easy. If you want to share diagrams with a non Gliffy user, it generates a simple URL which can be shared on social media and other channels so anyone can view the diagram. Gliffy allows you to export diagrams to Google Docs, presentations, web pages and most major image formats including JPG, PNG, PNG with transparent background and SVG. There’s a good choice of real objects to illustrate diagrams with although there aren’t many templates to choose from. If you just want a basic but easy online diagramming solution that imports Visio files, allows you to diagram offline and is suitable for teams, Gliffy is definitely worth checking out. You can try Gliffy for free and test drive it for yourself. Be aware however that the free version of Gliffy makes your diagrams public so it’s definitely not suitable for confidential data such as network diagrams. You can also check out our full review of Gliffy for more. Creately is a lightweight, fast and cost-effective alternative to Visio. Creately is a lot simpler than Visio but you can create some pretty impressive diagrams, Venn diagrams, flowcharts and process flows with it. Creately can import but not export to Visio VSDX format. There are some neat touches in Creately like shared project libraries, a useful Google Image search tool and auto snapping of objects connectors. Creately also integrates with Confluence, Jira and the G Suite Marketplace. Creately has a Mac desktop client which allows you to draw offline and sync any changes when you go online again. There are thousands of templates to choose from to get things done quickly. You can create up to 5 diagrams for free in Creately before deciding whether it’s for you. You can also read our review of Creately if you want to learn more. Pricing: $5 a month or $49 per year for individual users. 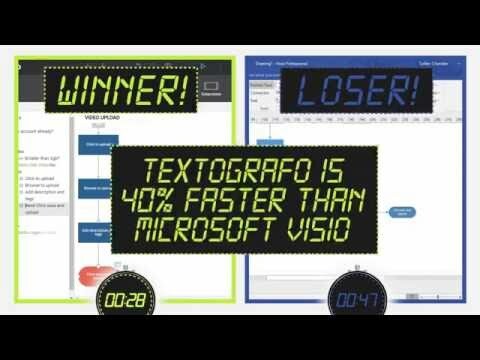 If you mainly use Visio for creating flowcharts then Textografo is a data input based alternative with a clean, minimalist interface. Textografo claims that by automating diagrams, it’s the fastest diagram tool on the market although it takes some getting used to first. Textografo doesn’t cater for all diagram formats but consists of a Flowchart Maker, Mindmap Maker, Decision Tree Maker, Organizational Chart Maker and a Sitemap Maker. Textografo takes a data input approach to diagramming by automating diagrams based on the data you feed it. Textografo is designed particularly with business processes in mind especially those in Process Analysis, Business Operations, Software Development, Sales & Marketing and Customer Service roles. Instead of drawing flowcharts by dragging and dropping shapes, you have to “program” it in Textografo using hashtags and instructions in the left hand margin and Textografo draws it. So for example, if you type “#decision” a decision box will appear in the diagram or type “#circle” and a circle appears. This removes the need to constantly align, resize and connect elements and objects in flowcharts by automating much of the process for you via syntax. However, as much as you’d sometimes like to, you can’t just drag and drop elements. Everything has to go through the Textografo syntax editor. You also can’t import or export Visio files into Textografo. In terms of pricing plans, Textografo Essentials is the basic version of Textografo and costs $4 per month but is limited to 5 private diagrams and 50 shapes per diagram. You can use Textografo free for 7 days before you have to purchase a plan. You can also read our full Textografo review for a more detailed look at it. Pricing: Textografo Essential costs $8 per month (limited to 5 diagrams) and Premium $14 per month. MyDraw (formerly known as Nevron Draw) is a budget desktop alternative to MS Visio. If the interface of MyDraw looks familiar, that’s because it’s heavily inspired by Microsoft Office’s Ribbon UI used in all MS Office products. Visio file format support is excellent in MyDraw including support for importing older VDX format and VSSX stencils too. MyDraw can also import, edit and export Visio VSDX files (although the results aren’t great with any type of Visio file). MyDraw can also import family tree diagrams in GEDCOM format used in genealogy software on Mac. Other export formats supported include PDF, AutoCAD’s DXF format and as high-resolution images. MyDraw has a very large number of shapes and objects to choose from and uses a powerful formula based engine similar to Visio. It also has automatic layout algorithms to speed things up when creating diagrams. There are plenty of free templates for simple mind maps, network diagrams, floor plans, fish bone diagrams, work flows, UML diagrams and electrical diagrams. If you like to draw diagrams on your iPad, MyDraw also supports the Apple Pencil and other graphics tablets that work with Macs. MyDraw isn’t quite on the same level as Visio but if you’re on a really tight budget and want a Mac desktop solution, it’s definitely worth downloading the free trial. You can also check out our full MyDraw review for more. Edraw Max is a cheaper desktop alternative to Visio but with a strikingly similar interface. There are a lot of similarities between Edraw and MyDraw, most notably that they’re both desktop apps plus they can both import and export Visio files. In fact the Edraw Max UI is very closely modeled on Microsoft Visio’s ribbon interface – so close in fact that it’s actually hard to distinguish the difference at first glance. Edraw supports high quality vector graphics allowing you to create eye-catching diagrams. Edraw supports VDX as well as VSDX files although the exported results aren’t always great and may involve some manual adjustment depending on the complexity of the diagram. Although there are only around 200 templates in Edraw Max, there’s enough there for basic flowcharts, org charts and brainstorming. You can snap and connect shapes or objects easily and there’s enough to create basic Visio diagrams. Overall, Edraw Max is an interesting option if you want something that looks like Visio, works on your Mac desktop but is considerably cheaper. You can test it first with the fully functional free trial of Edraw Max. You can also check out our full Edraw Max review for more. Pricing: Perpetual License costs $179 with no upgrade costs for 3 years. Lifetime License costs $245 with no upgrade costs. Subscription costs $99 per year. Finally, Ardoq is an Enterprise level, data input driven replacement for Visio which like Textografo, takes information you throw at it and then automatically generates Visio like flowcharts and diagrams. It’s aimed particularly at Product or Project Managers as it calculates dependencies and can provide estimates of project timelines and completion dates. Arqoq gives a good overview of complex workflows and systems so that they can get a better overview of knock-on effects and the interconnections between process flows. It automatically translates complex data that you give it into useful flowcharts and diagrams. This means less time sketching flowcharts and process flows manually. Diagrams dynamically update and change as you update the data that powers them such as via an Excel sheet or any other tool that has an API. Although Ardoq doesn’t allow much manual adjustment of diagrams, there are templates that you can customize manually and a plugin editor to configure how Ardoq visualizes data. Ardoq does not come cheap though. Because it’s aimed at corporate needs, pricing is only on request but even the basic Growth Plan will probably set you back around $999 per month. You can request a free demo of Ardoq to see if it’s right for your organization. You can also read our review of Ardoq for more. Which Is The Best Visio Alternative For Mac? SmartDraw is hard to beat as a powerful but far easier to use alternative to Visio. Its been around longer than almost any other diagramming software and all that experience, features and user interface know-how has clearly gone into SmartDraw Cloud for Mac users. Crucially, it’s the best alternative to Visio when it comes to importing and exporting VSDX files and if you’re going to be working with Visio based clients or colleagues, you should definitely look no further. If you’re still unsure which is the right option for you, check out the comparison table of Visio for Mac alternatives below to see them head-to-head. Is Visio Part Of Office 365 For Mac? Microsoft Visio is not included in the Standard version of Office 365. However, Microsoft Visio Online is now available in commercial Office 365 subscriptions to both Mac and PC users but it only allows basic editing and viewing of Visio files and there are many limitations. Visio Online is definitely not a replacement for Visio on Mac. For example Visio Online lacks things such as shape data, you can’t edit hyperlinks in diagrams and there are annoying glitches like session timeouts if you leave the browser tab idle for more than a few minutes. It also only works if you have saved the files in SharePoint Online or One Drive for Business – you can’t open Visio files that are saved locally on your Mac’s hard drive or sent to you via email. Mac users can however leave comments for other users in diagrams and Visio Online is also integrated with Skype for Business for Mac so that stakeholders can discuss diagrams with others. For iPhone and iPad users, there is also Microsoft Visio Viewer for iOS. Are There Any Free Alternatives To Visio On A Mac? The simple answer is you won’t get anything for free that can compete with a complex enterprise product like Microsoft Visio. However, there are some free alternatives to Visio that allow a certain amount of diagram making for free. You will find however that there are strict limitations on them such as the number of diagrams, tools and files you can save. They all use the free versions as gateways to encourage you to upgrade to the paid versions. Is It Possible To Run Visio On A Mac? Yes it is possible to run Visio on a Mac although we don’t recommend it as a solution as you can read here. 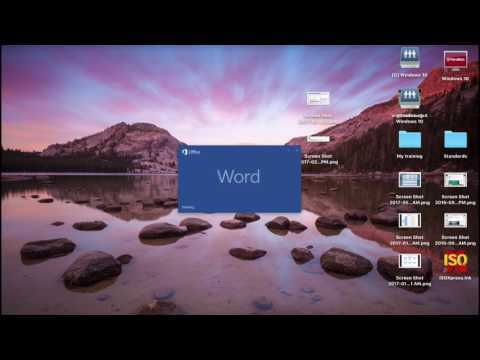 You can watch Visio running on a Mac below. Why Is There No Mac Version Of Visio? The main reason is the relatively small market share of Macs compared to PC. The cost of dedicating a team of developers and engineers to creating and maintaining a macOS version of Visio is not considered economically viable by Microsoft. Naturally, Microsoft also wants to keep its business users – which are the majority of Visio users – within the Windows ecosystem. Is There A Google Version Of Visio? There is no software made by Google that can compare with Microsoft Visio. The closest thing available is Google Drawings which is free and allows you to draw very basic diagrams in your browser. There’s also Google Sketchup but it’s a 3D modelling software mainly designed for doing CAD work on a Mac. We hope this article has helped you find a replacement for Visio on your Mac but if you have any suggestions, comments or experiences with the software featured here, let us know in the comments below. If you are dead set on open source and “free” software I would say that Dia, http://www.diagram.ly or any other that has been around a while are good. If you are willing to spend money on professional Visio alternative, and want to work with Visio files in a team, I would advise to look at ConceptDraw PRO. Thanks Frank. As stated above, we’ve looked at free alternatives to Visio here including Dia. This post focused exclusively on paid alternatives as they are the most realistic solutions for professionals. Awesome suggestion…. using it right now 🙂 – I started doing more on my Mac and less on Windows. You may also try Nevron Draw – http://www.nevronoffice.com – it is a low cost alternative for drawing software on MACs. Bob, Thanks for the tip. Nevron Draw is quite new but actually a pretty decent cheaper alternative to Visio on Mac so we’ve added it to the article. You mentioned that ConceptDraw PRO works seamlessly with Visio files. Upon my knowledge it can’t handle, neither import nor export, vsd files (but Visio XML = vdx files only). Anders, You can import VSD files into ConcepDraw Pro but you have to use ConceptDraw Visio File Conversion. It converts from Visio VSD into Visio XML files which have a VDX file extension. You simply have to email the VSD file to vsdconverter@csodessa.com and after about 15 minutes, it will be converted. I’ve made this clearer in the post now so thanks for highlighting. Wow, thanks a lot for informing about this. I definitely will try convertor because I’ve been looking for a simple way to use Visio files on my Mac! No problem Rogero – hope it helps you working with Visio files on Mac. Try an app call ToutchDraw for Mac in the app store. TouchDraw is nowhere near as good as Visio but it’s fine for very basic vector drawing and diagramming. ConceptDraw PRO v10 can import and export Visio 2013 files in native format (VSDX), and it can import and export Visio 2010 files in Visio’s XML format (VDX). The native save format for Visio 2013 is VDS. To open a VDS file one can send their file ConceptDraw’s file converter vsdconverter@csodessa.com, or ask the originator of the file to save it in VDX. Both Visio 2013 and ConceptDraw PRO 10 now save the graphic files in a compressed format that makes files much easier to handle. ConceptDraw PRO v10 can save drawings for users of either Visio 2010 or Visio 2013. Thanks Panji. Evolus Pencil isn’t suitable as a professional Visio replacement but we’ve looked at it here. I’ve searched an information in the web regarding Visio alternatives. Since we do migrate on Macs in my company (which are good news), I must to accept the fact of using a new tool (which is not very easy for some people). But looks like there are several good analogues. I’ve already tried Omnigraffle and Concept draw PRO and second looks ideal for me and my team, because there still will be several Windows users and Conceptdraw supports both Mac&PC, also because of very professional templates and free Visio convertor service in PRO. Thanks a lot to author. Glad it helped! If you are working in a team that’s on both PC and Mac then Conceptdraw Pro is definitely worth looking at. Thank you for this article. Very useful tips. Thanks Gerome – glad it helped you. Can Visio run under Parallels? Paul, Yes you can run Visio on Mac using Parallels. ConceptDraw is neat product and support is good. Thanks, glad that I found it. Glad you found ConceptDraw to be a good alternative to Visio on Mac. Can Visio open ConceptDraw files? Yes. ConceptDraw on Mac can save files in a format that can be opened in Visio. Any update on when the free Visio Alternatives to Mac article is going to be released? Hi Jody, Sorry about the delay but now you finally have it – The Best Free Alternatives to Visio for Mac is here! Hope it helps you. I would also recommend yEd Graph Editor. It is free and cross platform. Hi, We took a look at yEd Graph Editor in the article Best Free Alternatives to Visio on Mac. Thanks, great info! Which would you recommend if you have your own templates and stencils in Visio? Patty, Glad it helped you! OmniGraffle Pro now supports importing of Visio templates and stencils. You simply move copy the stencils into your OmniGraffle stencils directory or go to File and then open the stencil and OmniGraffle will prompt you to save it in your stencil folder. I like using visio to put floor plans together for houses. I have not found a replacement I can put on my make so I have to keep a PC too just for this. I am not looking for any 3d software for home designs. Is there a close comparable program for MAC. All of the above are fine for creating floor plans on Mac, especially Omnigraffle unless there is something specific in Visio that you need for floor plans. This article was very well done – informative an well written. I do not know when an update is in order, but bravo! Thanks and glad it helped you. You should add draw.io, it’s free, has a nice clear UI and allows you to do a ton of things. LibreOffice Draw ( https://www.libreoffice.org/ ) is a nice alternative. I used that on Windows. It did not crash like Visio did every time I used it. Wow! Impressively detailed review! I wish reviewers of other products on the web did 50% of what you’ve done here! Thank you very much!!! MyDraw provides support for Visio® drawing (VSDX) import and export. The application also provides support for Visio®-like “smart” shapes – dynamic diagram shapes based on formulas. I have a license for ConceptDraw Pro, but I could not import VSS stencils (MAC version). They promised this feature and failed to deliver. Now they discontinue the ConceptDraw and have new ConceptDiagram which is the same yet new features, but again they failed with the import of Visio stencils. The stencils are imported but are horrible looking….contacted support and so far I got replies from crickets. I will not buy the new version. Yes we noticed that the support for Visio importing and exporting is still very poor in the new version of ConceptDraw Diagram. You’re much better off using SmartDraw for Visio import and export support as it does a much better job. Let us know if you ever hear back from ConceptDraw support. Here is the response from support: (keep in mind that I am using this software on a MAC. I feel they have the best user interface but I personally relied heavily on Visio stencils from different vendors and I need to be able to import them in order to do my job and it may not be the case for most of you). Thank you for your case. We are totally and completely on your side. In the light of recent events, we are very sorry that you’ve encountered such a bulging case experiencing difficulties with importing files. At the moment your case has been escalated to our developers and Quality team. They are going to work this through for you fixing errors that arose in our software. Of course, as with every software, there are errors, even Microsoft is experiencing difficulties with its latest version of Windows 10, and we, unfortunately, are no exception. But we are working hard on this. Like any self-respecting company, we diligently work on our issues, and we try to improve the performance and quality of our software every day. In conclusion, we once again bring our apologies for the inconvenience. We will return to you with the solved case and help you with importing of your files without loss of quality. Thanks for sharing that. It sounds like they do acknowledge the problem and will try to fix it although the comparison with Windows 10 is a bit odd! Do let us know if they get back to you with a solution.